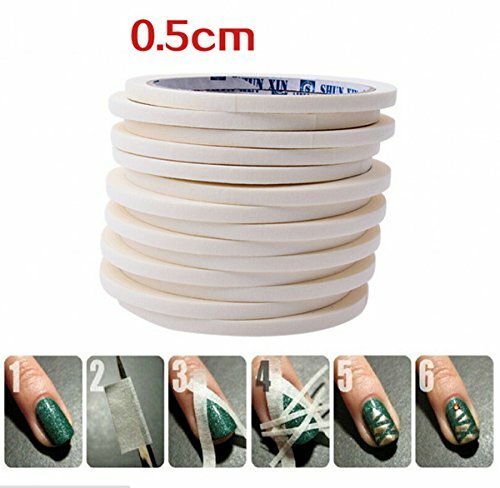 10 Roll Nail Art DIY White Stripe Glue Tape Roll Edge Guides Decoration Tool 0.5cm x 17m by Neutral at Designers Artists. MPN: CY. Hurry! Limited time offer. Offer valid only while supplies last. Strong viscosity. Great for both professional and home use. 1.Apply tip guide across curve of nails to separate tip area. 2.Apply two coats white manicure(nail polish) to area above the tip guide.Let dry.Gently peel off tip guides. 3.Apply Top coat for added shine.